The self-described 'gastro-pub' hits on two popular trends: farm-to-table food and locally crafted brews. It’s always a pleasure to welcome a new bar to the Portland scene, and it’s been happening a lot lately. Little Tap House is a recent addition, and it’s been open for about two months now. The bar’s location at High and Spring streets has been home to a few different places in my living memory, but I think Little Tap House has struck a chord that will likely resonate with Portlanders. The self-described “gastro-pub” hits on two very popular trends right now: farm-to-table food and locally crafted brews. Finding a decent (free) spot to park about a block away, I walked down the brick sidewalks to the bar. As I entered, I immediately appreciated the open space and bright atmosphere. There are so many tap houses, brewpubs and beer gardens that are dark and sometimes cramped. While I can appreciate a good, dark and cozy bar, sometimes a little daylight is nice. In the bar area, large barrels serve as tabletops, and cushioned swivel stools line the length of the bar. Little Tap House has 14 taps ranging in price from $5 to $7 a pint. The beer menu gives the name of the beer, the brewer, the style of beer and its alcohol-by-volume percentage. I ended up ordering a beer not yet listed on the print menu from a new brewery out in Lyman: Funky Bow’s End of the Line Pale Ale on tap. Being in a new bar, I figured I’d try the new brew. The bartender even offered me a small glass with a sip or two to try before I committed to a pint. I was not one bit disappointed. In addition to beer (which, of course, is the headliner), the pub serves wine and has a full array of alcohol for some tasty cocktails. 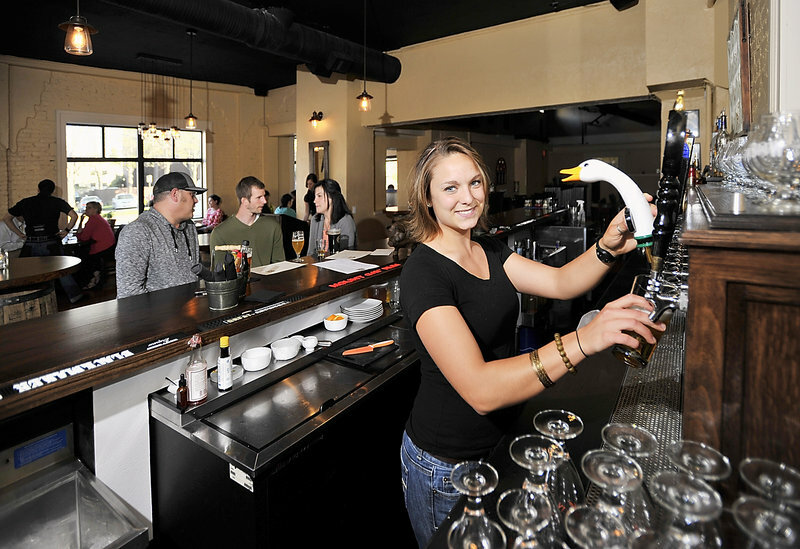 Although it’s relatively new, Little Tap House has received a hearty welcome from Portlanders and those visiting the area. The bar hosted a Maine Tweet Up, and has been crowded during happy hours and evenings. While most of the tables are equipped for two to four diners, the bar area is ideal for crowds, and the barrel tables make a perfect spot to gather with a circle of friends. Little Tap House’s location is also ideal. On the edge of the West End, the bar and restaurant is not far from the Cumberland County Civic Center, the State Theatre and the Portland Museum of Art. For people headed to an art opening, sporting event or concert, I’d say this establishment is going to quickly become the spot to go beforehand as well as the place to grab a drink afterward. One thing I particularly enjoy about Little Tap House is its happy hour. The bar and restaurant doesn’t just offer beer specials or food specials. Instead, it offers a pairing of beer and an appetizer for one unbeatable price. Wine pairings are a thing of the past; beer pairings are totally hip. Personally, I had to try the End of the Line Pale Ale simply because of its newness and its name. Then I made my own pairing and had grilled cheese, but added bacon and caramelized onions. I never order grilled cheese, because it’s one of those things that’s so easy to make at home; however, I’m glad this item caught my eye on the menu. It was the perfect food and beer pairing that I came up with all on my own. It’s sometimes hard to review a new bar simply because, as with any new business, there are quirks to be worked out. For instance, the computer was on strike while I was there, and the bartender had to “run” my credit card the old-fashioned way — by taking an imprint and writing out the bill. However, that’s a minor thing that doesn’t really impact the overall experience. It seems to me that Little Tap House has found a little niche in Portland, and is already well loved.